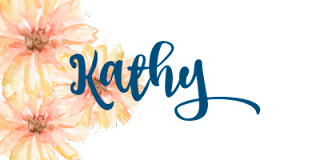 #stampinup #saleabration2018 #faithfulinkspirations I had so much fun making the soiree note cards earlier this week that I decided to make some more! I used the wonderful Tutti-Frutti Cards & Envelopes that are a FREE Sale-a-Bration item (only until March 31) when you place a $50 order. I love these cards so much! 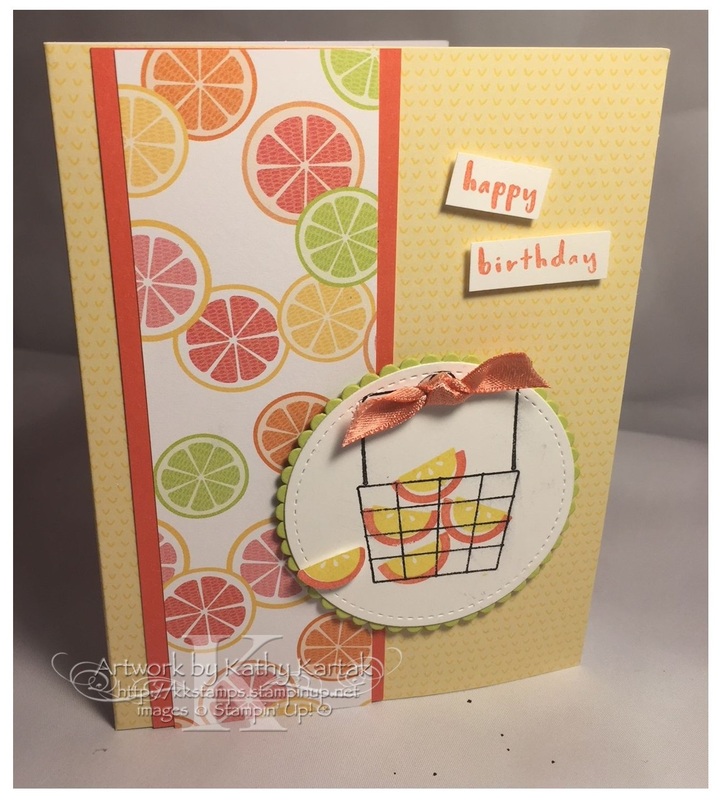 I used the "Fruit Basket" set and several of the Tutti-Frutti 6" by 6" Designer Series Papers. I kept the layout the same, but switched things up a bit for each card. Here's the set of finished cards and matching envelopes. For each card, the DSP strip is 1-3/4" by 5" and is adhered to a 2" by 5" strip of coordinating cardstock and then right onto the Tutti Frutti card. 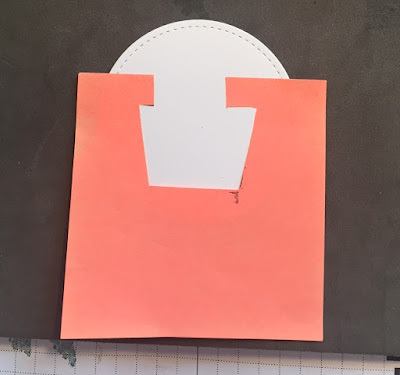 I used one of the Stitched Shapes Framelits to cut out a Whisper White Card Stock Circle and one of the Layering Circles Framelits to cut out a coordinating scalloped circle mat. Since I wanted the fruit to be inside the basket, I stamped the fruit first and then the basket over the top. I created a template from a Post-It Note so I knew where to place my fruits. I tied a coordinating ribbon in a knot and used a Glue Dot to adhere it to the circle. I also stamped an extra piece of fruit and punched it out with the coordinating Itty Bitty Fruit Punch Pack punch. 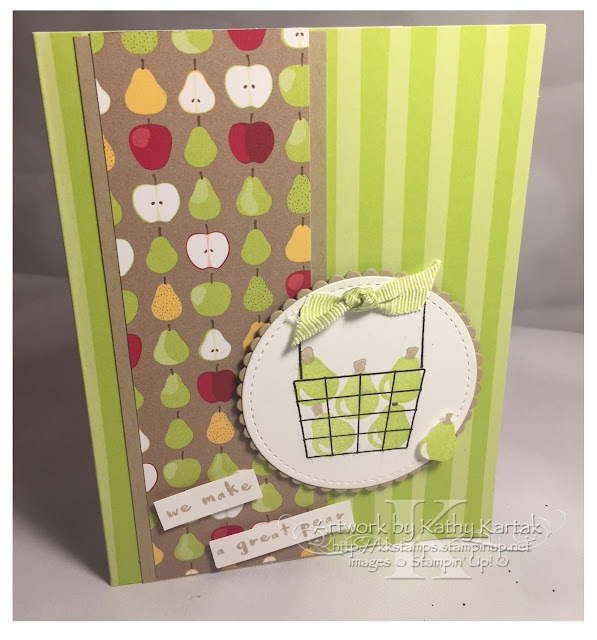 I adhered these little fruits the cards with a Mini Stampin' Dimensional. 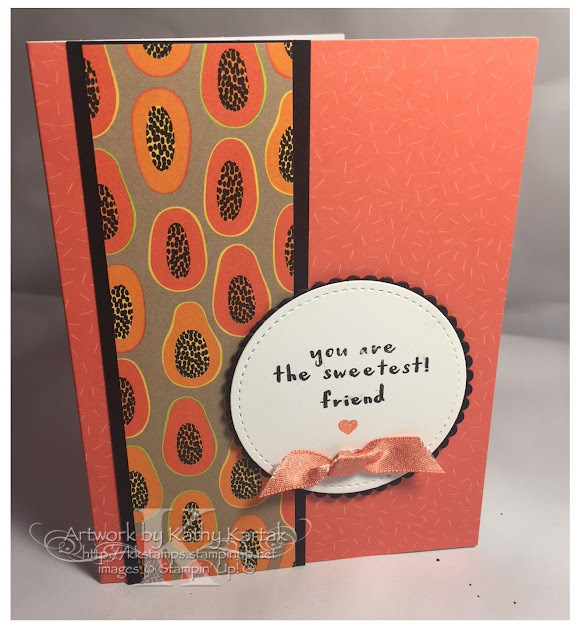 I stamped the sentiments onto a Whisper White scrap several times and punched them out with the Classic Label Punch so the lines were straight. I snipped out the words and adhered them to the cards with Mini Stampin' Dimensionals. The focal pieces are adhered with regular sized Stampin' Dimensionals. Have a look at these cute cards! They were so fun to make and will be a great gift item! 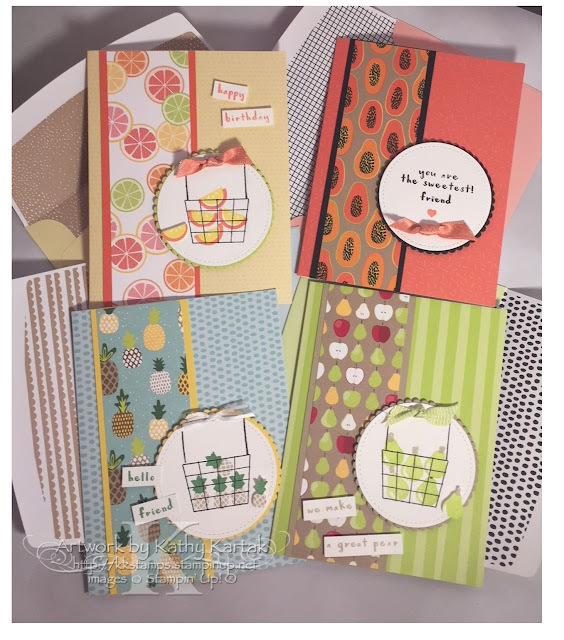 If you'd like to make a set of these cards, the supplies are listed below. 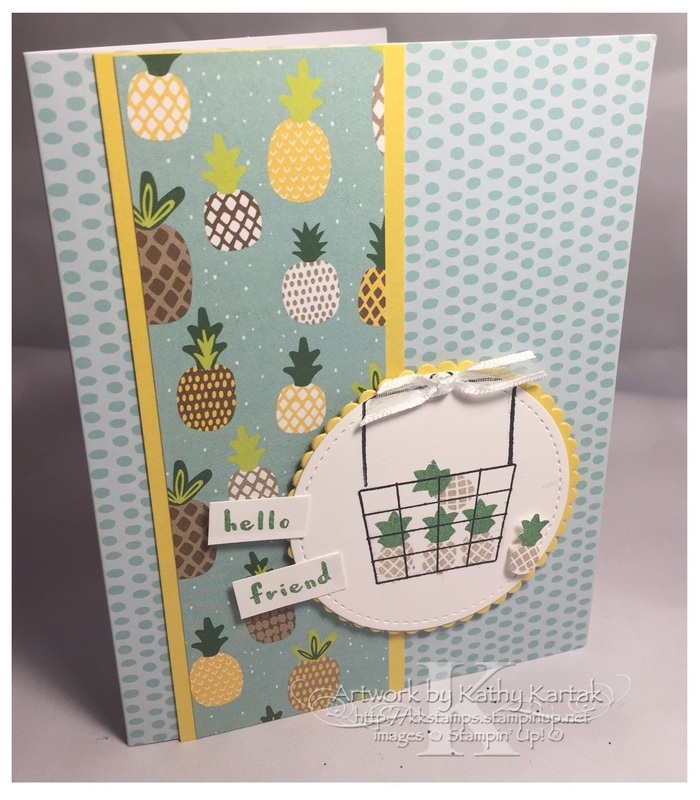 You can purchase the "Fruit Basket" stamp set and Itty Bitty Fruit Punch Pack as a bundle and save 10% off the price of purchasing them separately (item 145977 $35) and the Tutti-Frutti DSP Pack (item 145606 $10) and the 1/4" Whisper White Organza Ribbon (item 145590 $6) and you'll have spent $51 so you can get the Tutti Frutti Cards & Envelopes for your FREE Sale-a-Bration item (item 147242) or any other Level One SAB item! Don't delay! You only have a week before Sale-a-Bration ends on March 31st.